Steve Kinniburgh conceded his Corby Town team were “not good enough” after their title hopes suffered a major setback with a 2-1 defeat to Dunstable Town at Steel Park. The Steelmen went into the game having won six in a row on home soil in the Evo-Stik League South Division One Central. But, despite taking the lead through Connor Kennedy, the visitors hit back to inflict a damaging loss on Kinniburgh’s team. 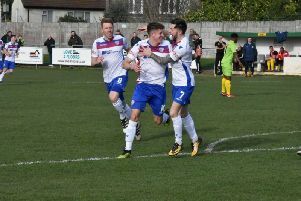 They are now eight points behind leaders Peterborough Sports and seven adrift of second-placed Bromsgrove Sporting after the top two both won. And Kinniburgh admitted: “We weren’t good enough from start to finish. “We weren’t at the races. We have gone 1-0 up in the game and allowed them back into it. “The first goal they have scored is a wonder-strike but we have had an off-day and we have been punished. “We probably try to stick to our gameplan a bit too much, even in the different conditions. “You look back at the last game we got beaten in before this one at the start of December against Didcot and the weather was a factor that day as well. “Maybe it’s something I have to look at, maybe it’s something that as a squad we need to adjust to. “But at the end of the day, they have had two, maybe three, shots on goal and scored two of them. Kinniburgh, however, was far from impressed with the performance of referee Reece Davies but even more infuriated when he wasn’t allowed to discuss the controversial moments with the official. The Steelmen thought they had salvaged a point late on when goalkeeper Dan George, who was up for a corner, looked to have bundled the ball into the net, only for a free-kick to be given to the visitors. And Kinniburgh added: “You get some good referees at this level who you can have a discussion with and they give you what they have seen. “But when a referee tells you ‘I’m not speaking to you’ then what do you take from that? “Maybe he has seen he has made the wrong decision and he doesn’t want to talk about it. “When a referee treats you like a human, you move on quickly but when one tells you they don’t want to talk to you and tell you to move away then I don’t understand it. “We have got Sam Grouse in there who is probably going to be out for the rest of the season after a horrific tackle and there wasn’t a booking for that. “And then the goal we got at the end looked legit from where I was standing. I spoke to the assistant and he said there was nothing but you try to speak to the referee and he doesn’t want to talk. “So you can’t even get an opinion from the guy who is making these decisions and that’s the frustrating part of it."